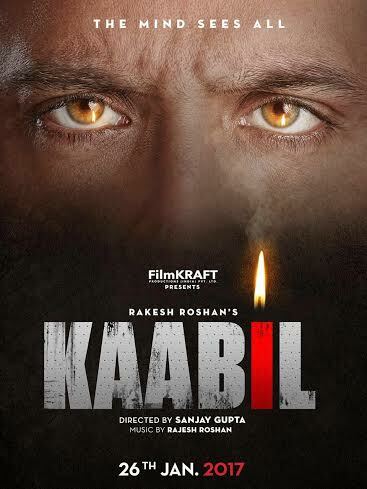 Hello Guys, We are here with Hrithik Roshan new upcoming movie Kaabil release date, star cast details, poster and trailer. This is an upcoming action thriller film. The film is being directed by Sanjay Gupta and produced by Rakesh Roshan under FilmKraft Productions Pvt Ltd. Hrithik Roshan & Yami Gautam are playing main lead character. Music is composed by Rajesh Roshan. The movie is going to release in 2017. The movie poster has already released. This is one of the biggest movie of year 2017. All fans of Hrithik Roshan are eagerly waiting this movie. I hope, the movie will be a big hit. Kaabil will be a revenge story of a blind man. The story of this film revolves around a blind man's revenge for his girlfriend's murder. The film will release on 26 January 2017.